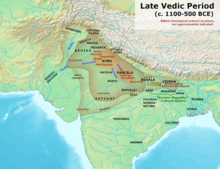 The Vedas were composed and orally transmitted with precision by speakers of an Old Indo-Aryan language who had migrated into the northwestern regions of the Indian subcontinent early in this period. The Vedic society was patriarchal and patrilineal. Early Vedic Aryans were a Late Bronze Age society centred in the Punjab, organised into tribes rather than kingdoms, and primarily sustained by a pastoral way of life. 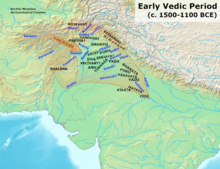 Around c. 1200–1000 BCE, Vedic Aryans spread eastward to the fertile western Ganges Plain and adopted iron tools which allowed for clearing of forest and the adoption of a more settled, agricultural way of life. The second half of the Vedic period was characterised by the emergence of towns, kingdoms, and a complex social differentiation distinctive to India, and the Kuru Kingdom's codification of orthodox sacrificial ritual. During this time, the central Ganges Plain was dominated by a related but non-Vedic Indo-Aryan culture. The end of the Vedic period witnessed the rise of true cities and large states (called mahajanapadas) as well as śramaṇa movements (including Jainism and Buddhism) which challenged the Vedic orthodoxy. The Vedic period saw the emergence of a hierarchy of social classes that would remain influential. Vedic religion developed into Brahmanical orthodoxy, and around the beginning of the Common Era, the Vedic tradition formed one of the main constituents of the so-called "Hindu synthesis". Some writers and archaeologists have opposed the notion of a migration of Indo-Aryans into India. Edwin Bryant and Laurie Patton used the term "Indo-Aryan Controversy" for an oversight of the Indo-Aryan Migration theory, and some of its opponents. These ideas are outside the academic mainstream. [note 2] Mallory and Adams note that two types of models "enjoy significant international currency" as to the Indo-European homeland, namely the Anatolian hypothesis, and a migration out of the Eurasian steppes. According to Upinder Singh, "The original homeland of the Indo-Europeans and Indo-Aryans is the subject of continuing debate among philologists, linguists, historians, archaeologists and others. The dominant view is that the Indo-Aryans came to the subcontinent as immigrants. Another view, advocated mainly by some Indian scholars, is that they were indigenous to the subcontinent." In this period the varna system emerged, state Kulke and Rothermund, which in this stage of Indian history were a "hierarchical order of estates which reflected a division of labor among various social classes". The Vedic period estates were four: Brahmin priests and warrior nobility stood on top, free peasants and traders were the third, and slaves, labourers and artisans, many belonging to the indigenous people, were the fourth. This was a period where agriculture, metal, and commodity production, as well as trade, greatly expanded, and the Vedic era texts including the early Upanishads and many Sutras important to later Hindu culture were completed. The Kuru Kingdom, the earliest Vedic "state", was formed by a "super-tribe" which joined several tribes in a new unit. To govern this state, Vedic hymns were collected and transcribed, and new rituals were developed, which formed the now orthodox Śrauta rituals. Two key figures in this process of the development of the Kuru state were the king Parikshit and his successor Janamejaya, transforming this realm into the dominant political and cultural power of northern Iron Age India. The end of the Vedic period is marked by linguistic, cultural and political changes. The grammar of Pāṇini marks a final apex in the codification of Sutra texts, and at the same time the beginning of Classical Sanskrit. The invasion of Darius I of the Indus valley in the early 6th century BCE marks the beginning of outside influence, continued in the kingdoms of the Indo-Greeks. Meanwhile, in the Kosala-Magadha region, the shramana movements (including Jainism and Buddhism) objected the self-imposed authority and orthodoxy of the intruding Brahmins and their Vedic scriptures and ritual. According to Bronkhorst, the sramana culture arose in "greater Magadha," which was Indo-European, but not Vedic. In this culture, kshatriyas were placed higher than Brahmins, and it rejected Vedic authority and rituals. The emergence of monarchical states in the later Vedic age led to a distancing of the rajan from the people and the emergence of a varna hierarchy. The society was divided into four social groups— Brahmanas, Kshatriyas, Vaishyas and Shudras. The later Vedic texts fixed social boundaries, roles, status and ritual purity for each of the groups. The Shatapatha Brahmana associates the Brahmana with purity of parentage, good conduct, glory, teaching or protecting people; Kshatriya with strength, fame, ruling, and warfare; Vaishya with material prosperity and production-related activities such as cattle rearing and agriculture; Shudras with the service of the higher varnas. The effects of Rajasuya sacrifice depended on the varna of the sacrificer. Rajasuya endowed Brahmana with lustre, Kshatriya with valour, Vaishya with procreative power and Shudra with stability. The hierarchy of the top three varnas is ambiguous in the later Vedic texts. Panchavamsha Brahmana and verse 13.8.3.11 of the Shatapatha Brahmana place Kshatriya over Brahmana and Vaishya, whereas, verse 1.1.4.12 places Brahmana and Vaishya over the Kshatriya and Shudra. The Purusha sukta visualised the four varnas as hierarchical, but inter-related parts of an organic whole. Despite the increasing social stratification in the later Vedic times, hymns like Rigveda IX.112 suggest some amount of social mobility: "I am a reciter of hymns, my father a physician, and my mother grinds (corn) with stones. We desire to obtain wealth in various actions." Household became an important unit in the later Vedic age. The variety of households of the Vedic era gave way to an idealised household which was headed by a grihapati. The relations between husband and wife, father and son were hierarchically organised and the women were relegated to subordinate and docile roles. Polygyny was more common than polyandry and texts like Tattiriya Samhita indicate taboos around menstruating women. Various professions women took to are mentioned in the later Vedic texts. Women tended to cattle, milked cows, carded wool; were weavers, dyers, and corn grinders. Women warriors such as Vishphala, who lost a leg in battle, are mentioned. Two female philosophers are mentioned in the Upanishads. Patrick Olivelle, in his translation of the Upanishads, writes that "the fact that these women are introduced without any attempt to justify or to explain how women could be engaged in theological matters suggests the relatively high social and religious position of at least women of some social strata during this period." In the later Vedic period, the tribes had consolidated into small kingdoms, which had a capital and a rudimentary administrative system. To aid in governing these new states, the kings and their Brahmin priests arranged Vedic hymns into collections and developed a new set of rituals (the now orthodox Śrauta rituals) to strengthen the emerging social hierarchy. The rajan was seen as the custodian of social order and the protector of rashtra (polity). Hereditary kingship started emerging and competitions like chariot races, cattle raids, and games of dice, which previously decided who was worthy of becoming a king, became nominal. Rituals in this era exalted the status of the king over his people. He was occasionally referred to as samrat (supreme ruler). The rajan's increasing political power enabled him to gain greater control over the productive resources. The voluntary gift offering (bali) became compulsory tribute; however, there was no organised system of taxation. Sabha and samiti are still mentioned in later Vedic texts, though, with the increasing power of the king, their influence declined. By the end of the later Vedic age, different kinds of political systems such as monarchical states (rajya), oligarchical states (gana or sangha), and tribal principalities had emerged in India. According to Michael Witzel's analysis of the Kuru Kingdom, it can be characterized as the earliest Vedic "state", during the Middle Vedic Period. However, Robert Bellah observes that it is difficult to "pin down" whether the Kurus were a true "state" or a complex chiefdom, as the Kuru kings notably never adopted royal titles higher than "rājan," which means "chief" rather than "king" in the Vedic context. The Middle Vedic Period is also characterized by a lack of cities; Bellah compares this to early state formation in ancient Hawai'i and "very early Egypt," which were "territorial states" rather than "city-states," and thus "it was the court, not the city, that provided the center, and the court was often peripatetic." Romila Thapar characterizes Vedic-era state formation as being in a condition of "arrested development," because local chiefs were relatively autonomous, and because surplus wealth that could have been directed towards state-building was instead used for the increasingly grandiose rituals that also served to structure social relations. 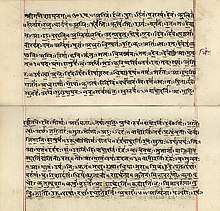 The period of the Upanishads, the final phase of the Vedic era, was approximately contemporaneous with a new wave of state formations, linked to the beginning of urbanization in the Ganges Valley: along with the growth of population and trade networks, these social and economic changes put pressure on older ways of life, setting the stage for the Upanishads and the subsequent sramana movements, and the end of the Vedic Period, which was followed by the Mahajanapada period. , archaeological data for the period of period from 1000 to 600 BCE shows a two-tiered settlement pattern in the Ganges Valley, with some "modest central places," suggestive of the existence of simple chiefdoms, with the Kurukshetra District itself displaying a more complex (albeit not yet urbanized) three-tiered hierarchy. Subsequently, (after 600 BCE) there are four tiers of site sizes, including large towns and fortified cities, consistent with an urbanized state-level society. Economy in the Vedic period was sustained by a combination of pastoralism and agriculture. There are references, in the Rigveda, to the leveling of fields, seed processing, and storage of grains in large jars. War bounty was also a major source of wealth. Economic exchanges were conducted by gift giving, particularly to kings (bali) and priests (dana), and barter using cattle as a unit of currency. While gold is mentioned in some hymns, there is no indication of the use of coins. Metallurgy is not mentioned in the Rigveda, but the word ayas and instruments made from it such as razors, bangles, axes are mentioned. One verse mentions purification of ayas. Some scholars believe that ayas refers to iron and the words dham and karmara refer to iron-welders. However, philological evidence indicates that ayas in the Rigveda refers only to copper and bronze, while iron or śyāma ayas, literally "black metal", first is mentioned in the post-Rigvedic Atharvaveda, and therefore the Early Vedic Period was a Bronze Age culture whereas the Late Vedic Period was an Iron Age culture. The rishis, the composers of the hymns of the Rigveda, were considered inspired poets and seers (in post-Vedic times understood as "hearers" of an eternally existing Veda, Śrauta means "what is heard"). The mode of worship was the performance of sacrifices (Yajna) which included the chanting of Rigvedic verses (see Vedic chant), singing of Samans and 'mumbling' of sacrificial mantras (Yajus). Yajna involved sacrifice and sublimation of the havana sámagri (herbal preparations) in the fire accompanied by the chanting of the Vedic mantras. The sublime meaning of the word yajna is derived from the Sanskrit verb yaj, which has a three-fold meaning of worship of deities (devapujana), unity (saògatikaraña) and charity (dána). An essential element was the sacrificial fire—the divine Agni—into which oblations were poured, as everything offered into the fire was believed to reach God. People prayed for abundance of rain, cattle, sons, long life and gaining 'heaven'. Around the beginning of the Common Era, the Vedic tradition formed one of the main constituents of the so-called "Hindu synthesis". Vedic religion survived in the srayta ritual, whereas ascetic and devotional traditions like Yoga and Vedanta acknowledge the authority of the Vedas, but interpret the Vedic pantheon as a unitary view of the universe with 'God' (Brahman) seen as immanent and transcendent in the forms of Ishvara and Brahman. Later texts such as the Upanishads and epics, namely the Gita of Mahabharat, are essential parts of these later developments. Mantra language texts: This period includes both the mantra and prose language of the Atharvaveda (Paippalada and Shaunmkiya), the Rigveda Khilani, the Samaveda Samhita (containing some 75 mantras not in the Rigveda), and the mantras of the Yajurveda. Many of these texts are largely derived from the Rigveda, but have undergone certain changes, both by linguistic change and by reinterpretation. Conspicuous changes include change of vishva "all" by sarva, and the spread of the kuru- verbal stem (for Rigvedic krno-). This is the time of the early Iron Age in north-western India, corresponding to the Black and Red Ware (BRW) and Painted Grey Ware (PGW) cultures, and the early Kuru Kingdom, dating from c. the 12th to 11th century BCE. Samhita prose texts: This period marks the beginning of the collection and codification of a Vedic canon. An important linguistic change is the complete loss of the injunctive. The Brahmana part ('commentary' on mantras and ritual) of the Black Yajurveda (MS, KS, TS) belongs to this period. Archaeologically, the Painted Grey Ware (PGW) culture from c. 1000 or 900 BCE corresponds to the Kuru Kingdom and the subsequent eastward shift of the political centre from the Kurus to the Panchalas on the Ganges. ^ The roots of this culture seem to go further back to the Sintashta culture, with funeral sacrifices which show close parallels to the sacrificial funeral rites of the Rigveda. 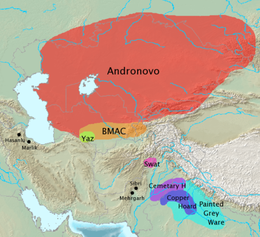 Around 1800–1600 BCE, the Indo-Aryans are believed to have split off from the Iranians whereupon they were defeated and split into two groups by the Iranians, who dominated the Central Eurasian steppe zone and "chased them to the extremities of Central Eurasia." One of these Indo-Aryan groups would found the Mitanni kingdom in northern Syria (c. 1500–1300 BCE). The other group were the Vedic people, who were pursued by the Iranians "across Iran into India." Michael Witzel (2001), "Autochthonous Aryans? The Evidence from Old Indian and Iranian Texts", in Electronic Journal of Vedic Studies (EJVS), vol. 7–3, pp. 1–93. Shereen Ratnagar (2008), "The Aryan homeland debate in India", in P. L. Kohl, M. Kozelsky and N. Ben-Yehuda (edd. ), Selective remembrances: archaeology in the construction, commemoration, and consecration of national pasts, pp. 349–378. Suraj Bhan (2002), "Aryanization of the Indus Civilization" in K. N. Panikkar, T. J. Byres and U. Patnaik (edd. ), The Making of History, pp. 41–55. Bryant: "This does not mean that the Indigenous Aryan position is historically probable. The available evidence by no means denies the normative view—that of external Aryan origins and, if anything, favors it." Michael Witzel: "The 'revisionist project' certainly is not guided by the principles of critical theory but takes, time and again, recourse to pre-enlightenment beliefs in the authority of traditional religious texts such as the Purånas. In the end, it belongs, as has been pointed out earlier, to a different 'discourse' than that of historical and critical scholarship. In other words, it continues the writing of religious literature, under a contemporary, outwardly 'scientific' guise. Though the ones pursuing this project use dialectic methods quite effectively, they frequently also turn traditional Indian discussion methods and scholastic tricks to their advantage [...] The revisionist and autochthonous project, then, should not be regarded as scholarly in the usual post-enlightenment sense of the word, but as an apologetic, ultimately religious undertaking aiming at proving the 'truth' of traditional texts and beliefs. Worse, it is, in many cases, not even scholastic scholarship at all but a political undertaking aiming at 'rewriting' history out of national pride or for the purpose of 'nation building'." In her review of Bryant's "The Indo-Aryan Controversy" Stephanie Jamison, Professor, Department of Asian Languages & Cultures, comments: "...the parallels between the Intelligent Design issue and the Indo-Aryan "controversy" are distressingly close. The Indo-Aryan controversy is a manufactured one with a non-scholarly agenda, and the tactics of its manufacturers are very close to those of the ID proponents mentioned above. However unwittingly and however high their aims, the two editors have sought to put a gloss of intellectual legitimacy, with a sense that real scientific questions are being debated, on what is essentially a religio-nationalistic attack on a scholarly consensus." ^ At least 383 non-Indo-European words were borrowed from this culture, including the god Indra and the ritual drink Soma, which according to Anthony was "probably borrowed from the BMAC religion." "Many of the qualities of Indo-Iranian god of might/victory, Verethraghna, were transferred to the adopted god Indra, who became the central deity of the developing Old Indic culture. Indra was the subject of 250 hymns, a quarter of the Rigveda. He was associated more than any other deity with Soma, a stimulant drug (perhaps derived from Ephedra) probably borrowed from the BMAC religion. His rise to prominence was a peculiar trait of the Old Indic speakers." ^ According to Erdosy, this battle provided a prototype for the epic Mahabharata, Hiltebeitel calls this idea a "particularly baffling fancy." ^ McClish, Mark; Olivelle, Patrick (2012), "Introduction", in M. McClish; P. Olivelle (eds. ), The Arthasastra: Selections from the Classic Indian Work on Statecraft, Hackett Publishing, p. xxiv, ISBN 1-60384-903-3 : "Although the Vedas are essentially liturgical documents and increasingly mystical reflections on Vedic ritual, they are sufficiently rich and extensive to give us some understanding of what life was like at the time. The earliest of the Vedas, the Ṛgveda Saṃhitā, contains 1,028 hymns, some of which may be as old as 1500 BCE. Because the Vedic texts are the primary way in which we can understand the period between the fall of the IVC (ca 1700) and the second wave of urbanization (600 BCE), we call the intervening era of South Asian history the 'Vedic Period.'" ^ Jamison, Stephanie W. (2006). "The Indo-Aryan controversy: Evidence and inference in Indian history (Book review)" (PDF). Journal of Indo-European Studies. 34: 255–261. ^ Witzel's study is furthermore cited by Alf Hiltebeitel, Dharma: Its Early History in Law, Religion, and Narrative, Oxford University Press, 2011, p. 57 (online); Proferes, Theodore (2003), "Kuru kings, Tura Kavaseya and the -tvaya Gerund", in Bulletin of the School of Oriental and African Studies, vol. 66 (2), pp. 210–219 (online). ^ Bellah 2011, p. 509, citing Patrick Olivelle's introductory remarks to his translation of the Upanishads (online). ^ Erdosy, George. "The prelude to urbanization: ethnicity and the rise of Late Vedic chiefdoms," in The Archaeology of Early Historic South Asia: The Emergence of Cities and States, ed. F. R. Allchin (Cambridge University Press, 1995), pp. 75–98 (online). ^ Erdosy, George. "City states of North India and Pakistan at the time of the Buddha," in The Archaeology of Early Historic South Asia: The Emergence of Cities and States, ed. F. R. Allchin (Cambridge University Press, 1995), p. 99–122 (online). ^ Holdrege (2004:215). Panikkar (2001:350-351) remarks: "Ṛta is the ultimate foundation of everything; it is "the supreme", although this is not to be understood in a static sense. [...] It is the expression of the primordial dynamism that is inherent in everything...."
^ Stephanie W. Jamison and Michael Witzel in Arvind Sharma, editor, The Study of Hinduism. University of South Carolina Press, 2003, page 65: "... to call this period Vedic Hinduism is a contradiction in terms since Vedic religion is very different from what we generally call Hindu religion - at least as much as Old Hebrew religion is from mediaeval and modern Christian religion. However, Vedic religion is treatable as a predecessor of Hinduism." Witzel, Michael (1989), "Tracing the Vedic dialects", Dialectes dans les litteratures Indo-Aryennes ed. Caillat, Paris, 97–265.